Travel through Brazil to learn about the National Horse of Brazil–– the Mangalarga Marchador. Brazil is a country with great history and tradition. They still perform what I would call lost arts "true craftsmanship" learned from their fathers and father's fathers. With no cell phones and almost no television, we sink into the relaxation of no pressing deadlines and no contact with the outside world. Of course, our main reason for visiting Brazil is the horses. The National Horse of Brazil is the Mangalarga Marchador. It is a breed that we fell in love with long ago. We visit Brazil almost every year and continue to enjoy the wonderful, warm people, who are polite and gracious. 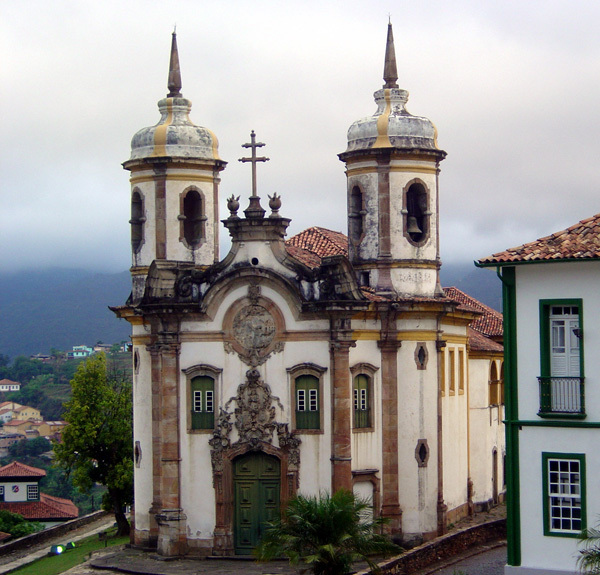 This trip we travel to Ouro Preto before we get to the breeding farms that are our final destination. 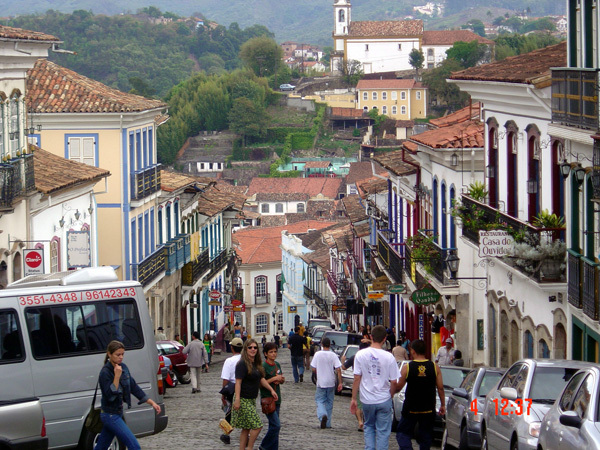 Ouro Preto means “black gold". The city is located in the mountains where many mines exist for many minerals and gemstones. The gold found here is embedded in iron ore, hence the name. The city was founded in the 1700s and was extremely wealthy as depicted in the church built on almost every corner block. The churches are lavishly decorated and sculpted. The town is virtual reality of the 1700s with cobbled streets and mountain springs that feed fountains in the city where people still get water. There are plenty of shops and local artisans. The gemstones are everywhere, including on the street. We decide to buy some of the trademark gemstones in the shops and on the streets. The bargaining is too hard to resist. Even if the stones are colored glass, it is a lot of fun. My heirs will discover the truth on the Antiques Roadshow, no doubt! We drive, with only a few wrong turns, from the state of Minas Gerais to Rio de Janeiro to our home base for the next several days, Fazenda Santarem. Our host is Olavo Monteiro, the owner of the fazenda, and a man who helped many in exporting the Marchador to Germany and to the U.S.
A fazenda is the name for a ranch in Brazil that produces multiple products or crops. 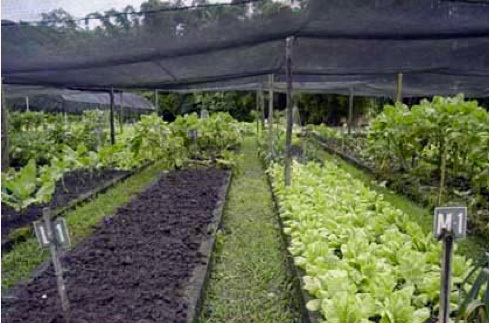 On this particular ranch, they grow their food, coffee, sugar cane, fruits like passion fruit, cattle and horses. We arrive dusty and worn out by the long car ride which is over dirt roads for the last 10 miles or so. The fazenda is warm and inviting with a bedroom suite for each of the six of us. At dinner, we rediscover the freshness of the food. It is wonderful, making you notice how many additives there must be in U.S. food, especially compared to the prepared food I eat. The difference is enormous. The dessert course tops everyone's expectations. The chef has prepared several choices, and we all have our favorites around the table. Mine is Dolce e Leche, a sweet caramel chocolate pudding. The most interesting name award goes to Romeo and Juliet, a combination of farm cheese and red guava jelly. They are never served without each other. The next day dawns and we have three farms to visit and many horses to see. We try hard, but sometimes lose track of the names, although, there are a few you never forget. 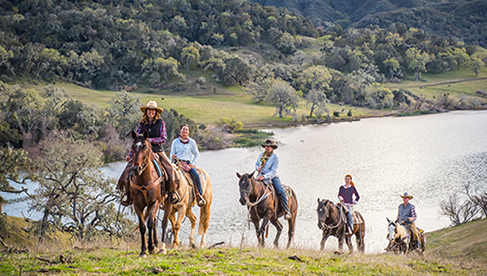 Besides viewing the horses, we take time off to ride in the countryside. The area is lovely; green and hilly with lots of natural waterfalls, rivers and ponds. It is easy to ride in Brazil. The number of people is immaterial; horses keep being saddled until the group is mounted. In Brazil, even the most novice rider can feel safe, as they take care on matching horse and rider. These large group rides are great for the novice horses too. The Brazilian tradition is not to ride a horse until after age three. With a light bit and experienced rider, they get valuable time and no stress riding along with the experienced mounts. On one ride, we travel from one fazenda to another, for lunch, of course. Along the way, we help move the cattle, the Nelore, from one field to another. We sing to the cattle as we move them with the call they teach us which sounds for all the world like OH BOY. Oh boy, lucky for us, these cattle are very mild tempered. On our last day on the ranch, we find time for one final group photo and some local shopping before we start our drive back to Rio. We arrive back in Rio, with only one day to enjoy the vibrant city full of multi-cultural restaurants. We stay on the beach in Ipanema and sing the famous songs, but I can tell you that even after only one day, I missed my jeans and half-chaps. 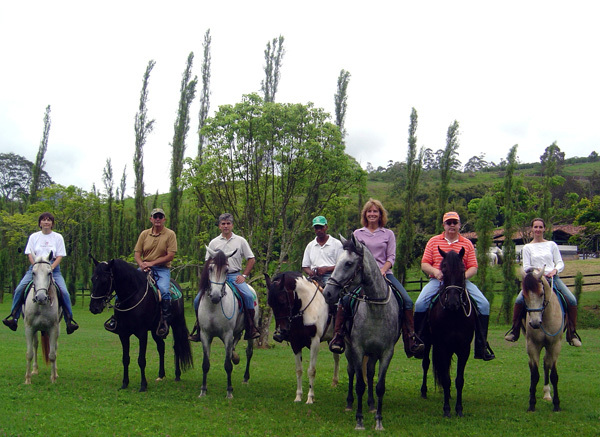 There are many horseback-riding adventures available in Brazil on the Mangalarga Marchadors. 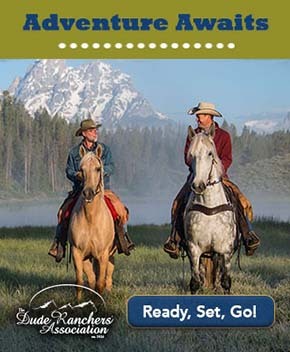 About the author: Lynn Kelley and her husband own Summerwind Marchadors, specializing in Mangalarga Marchador horses. For more information on the breed, visit Summerwind Marchadors website or the U.S. Mangalarga Marchador Association website. 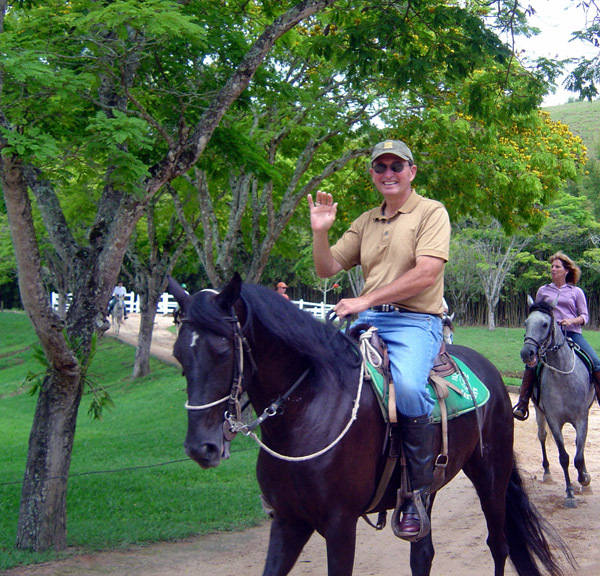 Learn about horseback riding vacation in Brazil on EquitrekkingTravel.com, which features great international riding holidays.